Israeli soldier, Cpl. Gilad Shalit, 19, at an unknown location in Israel..
Having secured the release of kidnapped BBC correspondent Alan Johnston on July 4th, Hamas officials are now moving discreetly to negotiate freedom for another Gaza hostage  Israeli soldier Gilad Shalit. Shalit, seized in June 2006 in a raid by Palestinian militants who had tunneled under the Israeli security wall around Gaza, is currently being held by kidnappers who include members of Hamas' own military wing, as well another radical group, the Popular Resistance Committees. An investigation by TIME reveals a marked contrast in how the Israelis and Hamas view their complicated on-again, off-again negotiations over Shalit's release. The disconnect arises partially out of Israel's refusal to deal directly with Hamas, which they consider a terrorist organization. While some informed Israelis say they are "optimistic" that Shalit will be free "within weeks," Hamas officials are far more cautious  one offered the glum assessment that bargaining could drag on for another year. Israeli military officials and Hamas officials told TIME that the two sides are able to negotiate on the issue via Egyptian intelligence chief Omar Suleiman, and also in direct talks between Israelis and senior Hamas commanders imprisoned in Israel. The inmates then smuggle messages to the Hamas leadership via lawyers and relatives visiting them in prison. One Hamas official told TIME that last spring, the militants proposed a deal in which Israel would hand over 1,400 prisoners  at first, 300 Palestinians would be released, and in exchange Hamas would move Shalit from Gaza to Egypt. The Israeli soldier would then be turned over to the Israelis, and another 400 Palestinians would be freed. 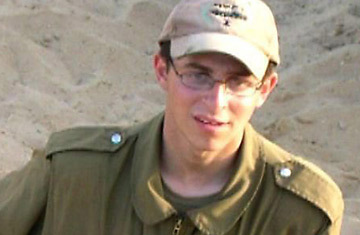 Seven month after Shalit is safely home, Israel would then free another 700 prisoners. Included in the list were 100 "must release" Palestinians, all convicted of terrorist acts against Israelis. Israel balked at letting loose prisoners "with blood on their hands," who might strike again. According to a senior Hamas official, that deal fell at the first hurdle: Israel refused to release only a handful of the prisoners on the Hamas list. Negotiations simmered until June, when Hamas seized control of Gaza from rival Fatah militiamen, and talks were broken off. Now, Israel is debating the possibility of freeing around 400 prisoners, including some on Hamas' top 100 list who are deemed unlikely to terrorize Israel again. But Israeli Prime Minister Ehud Olmert, according to a Tel Aviv-based intelligence official, is refusing to release any prisoners who aren't Hamas. (Hamas asked for freedom for members of other Palestinian factions, as well as foreign terror suspects in Israeli hands.) Apparently, Olmert wants to avoid Hamas being seen to gain legitimacy among the Palestinian public by securing prisoner releases, according to this source. To boost Palestinian President Mahmoud Abbbas in his struggle with Hamas, Olmert has vowed to release 250 of Fatah loyalists, a deal criticized by Palestinians as selfish on Abbas' part. One Hamas offical says he doubts that the militant leadership would accept Israel's new terms, and he blamed Israel for attempting to "sabotage" the prisoner swap. Egyptian Intelligence Chief Suleiman was quoted in the Israeli press as telling Israeli leftist politicians recently that Olmert was "stalling" and must show some flexibility towards Hamas. The Israelis want their soldier freed, but are understandably reluctant to release a horde of potentially dangerous ex-terrorists. The impasse arises because both Israel and Hamas believe that they hold the stronger hand and don't want to compromise. As canny observers of Israeli politics, Hamas knows that Prime Minister Ehud Olmert could use the freeing of Shalit to boost his plummeting popularity. Meanwhile, the Israelis reckon that Hamas could capitalize on the exchange of hundreds of prisoners as a way to improve their support among Palestinians, and their international standing. Israel and Western government slapped an economic blockade on 1.5 million Gaza residents now living under Hamas' rule, and it would help Hamas' standing if these sanctions were loosened. The Israelis toughened their negotiating stance believing that with international sanctions squeezing Gaza, Hamas might be desperate to strike a deal. And Hamas has certainly exhibited a new willingness to bargain: exactly a year after Shalit's kidnapping, his captors released an audio tape of the soldier pleading for Olmert to do more to release him. Although Israel publicly refuses to deal directly with Hamas "terrorists," Israel's top hostage negotiator, Ofer Dekel, met recently with jailed Hamas commanders to persuade them to put pressure on their leadership to accept the new offer. Inside prison, Palestinian inmates are separated according to their allegiance to Hamas or Fatah, since otherwise they would clash, a mirror of their rivalry inside the Palestinian territories. Hamas prisoners are better organized and more disciplined than Fatah inmates, according to Anat Berko, a criminologist at the International Policy Institute for Counter-Terrorism in Herzliya, who frequently speaks with the Palestinian inmates. She says that Hamas' efforts to free as many Palestinian prisoners as possible, and not just those belonging to Hamas, has earned the Islamic militants greater support among the 10,000 Palestinians in Israeli prisons. Still, Hamas officials urge Israel to speak directly with them, since they were freely elected in the January 2006 Palestinian elections, and they now exercise control over Shalit's kidnappers in Gaza. "We are willing to talk directly to the Israelis," says one Hamas official. "So why are the Israelis play the ostrich with us? They're willing to talk with our men in jail but not to us directly."